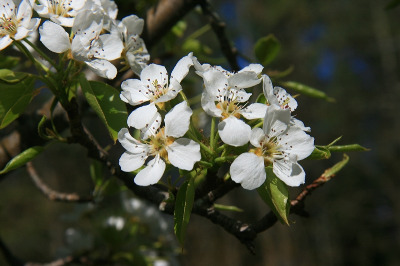 The origins of the orchard pear are lost in antiquity, and it is not certain which species of wild pear are its Old World ancestors. Countless cultivars are grown and occasionally a discarded core or other means of dispersal will result in a tree strayed from cultivation to fencerows, clearings, and other disturbed sites. First collected as an escape in 1892 in St. Clair Co. Pears also spread by suckering, forming dense thickets at old orchards or farmyards. Pear leaves are shinier than those of apple, with a much closer more distinct pinnate venation, and are essentially glabrous at maturity. MICHIGAN FLORA ONLINE. A. A. Reznicek, E. G. Voss, & B. S. Walters. February 2011. University of Michigan. Web. April 21, 2019. https://michiganflora.net/species.aspx?id=2532.